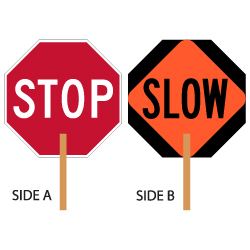 Reflective, two-sided STOP-SLOW paddle sign for School Crossing Guards, Police Departments and Municipalities, Road Maintenance Work Crews. Our STOP-SLOW paddle signs use 3924 fluorescent orange microprismatic reflective sheeting, which is used for the production of high quality work zone signs. Highly visible at wide angles in daytime, twilight, inclement weather and at night. Exceeds ASTM D4956-09 Spec Type IV and Type VIII standards. High Intensity Prismatic (HIP) Reflective STOP-SLOW Sign Paddles - HIP provides higher levels of retroreflectivity versus engineer grade and standard high intensity. Where Engineer Grade uses encapsulated glass beads, High Intensity Prismatic uses prismatic technology to provide increased retroreflectivity levels four times brighter than engineer grade. HIP is effective in both well-lit areas and in areas with low levels of light in the vicinity. Signs that commonly use HIP are STOP signs, speed limit signs, and crosswalk & pedestrian warning signs. HIP meets ASTM D Type III & Type IV specifications for retroreflectivity and is backed with a 10-year warranty. Diamond Grade (DG3) -Reflective STOP-SLOW Sign Paddles - highly reflective microprismatic sheeting used on signs that must be seen by road users in all types of traffic and weather conditions. Diamond grade is commonly used on freeway & highway signs, school zone signs, street name signs, and stop signs. Our Diamond Grade options meet ASTM D Type IX & Type XI specifications for retroreflectivity and are backed with a 12 year warranty.